Brackley Girls vs Brackley Ladies. 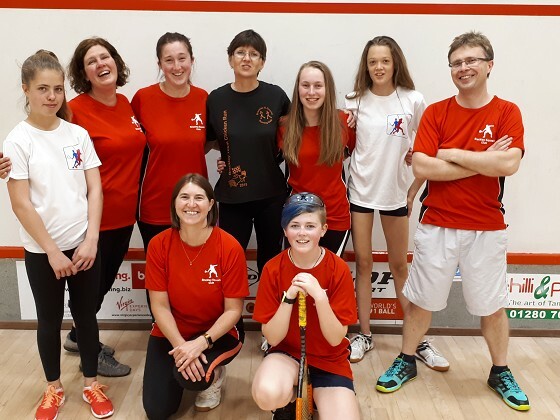 On the 29th June we held an interclub match between a Brackley Ladies Team and a Brackley Girl;s team. Most of the teams knew each other as they had been training together over the last year. Bizarrely by some twist of fate both number 5s were injured on the day of the match, so it was 4 vs 4. The first two matches were very close with Caitlin (girls) beating Rosie (Ladies) 3-0 in some very tight games. Elouise (girls) played Emily (ladies) again with some very tight matches Elouise pipped Emily 3-0. Tia (girls) off her bed after a night out at her leaving ball, played Tracey, again some excellent play with a 3-0 win. Lastly the number 1’s Emma (girls) and Sam (Ladies) played, Sam had no played for a few weeks and her lack of match practice meant Emma won 3-0. The event was a great success with all going for the traditional Chilli and Pepper curry. It was good to see everyone getting on so well and a real club spirit (and a few beers). Well done to all who played there was great spirit and some excellent play. We look forward to a few more matches in the future.